This time I guided a man from Singapore. He is an architect. I made a plan for him. I thought he prefer to see some historic architectural site. I chose Ninnaji temple and Kotoin as a part of the plan. He was very fond of them. Especially the entrance of Kotoin. In Kotoin, we can see the tea room which used to be used by Hosokawa Familly, one of the powerful fuedal loads in Momoyama Period. ( a latter half of the 16th century) Though it was very small room, it has many meanings, for example, the entrance is small and square. Why? When I meet you as a guide, I will tell you about!! 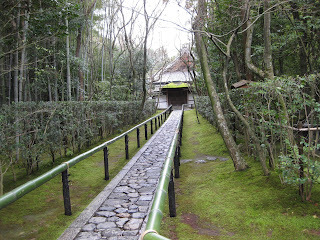 This is a very small temple, but atmosphere of the path to the entrance is very calm. I am sure you will like it. 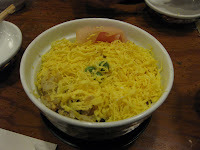 We visited Ryogenin in Daitokuji, and came back to Nishiki Food market after visiting Nijo Castle. Then we had late lunch. It was so-called MUSHIZUSHI, steamed sushi. when served, it was very hot. I think it's good for such cold winter lunch!